Around 450 Highland pre-schoolers as well as children in the Highlands and Islands branch of Down’s Syndrome Scotland are set to enjoy fun and educational music workshops over the next school year, thanks to funding just announced by Creative Scotland for Inverness-based charity Artsplay Highland. Following on from Artsplay Highland’s successful “Music Matters” workshops piloted in 2013-2014 and successfully extended in 2014-2015, their new “Music Matters” programme will see classes in 16 school nursery groups in the Highlands enjoy weekly workshops aimed at helping them develop music-centred skills through the use of songs/rhymes, games, percussion, and music technology. For the first time, Artsplay Highland will also be working with the local branch of Down’s Syndrome Scotland to run specially-tailored sessions for their young members. The nursery schools involved in the 2016-2017 project include Inverness’s Merkinch, Central, Limetree and Dalneigh Nurseries; Craighill in Tain; Park Primary in Invergordon; three Gaelic medium nurseries in Dingwall, Drumnadrochit and Tain; and Tomnacross, Teanassie and Dochgarroch. 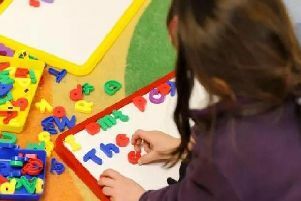 Most nurseries will receive two 45-minute sessions per day (morning and afternoon for different groups of participants). As well as the sessions for children, the “Music Matters” programme provides training for nursery staff and volunteers to help them to continue to provide fun musical activities for their classes after their Artsplay sessions finish. The weekly “Music Matters” sessions will be delivered by early years music specialists who are experts in engaging young children in music. In addition, Artsplay Highland will bring in guest artists to inspire the children through the use of other activities such as professional bubble blowing to set music, live music, visual artists and music technology. All children involved will have the opportunity to take part in an end of project ‘class concert’ (held in June) to share their musical learning and creative development with parents, carers and staff of the participating nurseries, as well as receiving a DVD that will be created during the project and which will include some of their songs, dances, performances, guest artists and compositions.